вЂњDTCвЂќ includes DTC at the 1st trip. Refer to TM-140, "Diagnostic Work Sheet" and interview the customer to obtain the malfunction information (conditions and environment when the malfunction occurred) as much as possible when the customer brings in the vehicle. Before checking the malfunction, check whether any DTC exists. If DTC exists, perform the following operations. 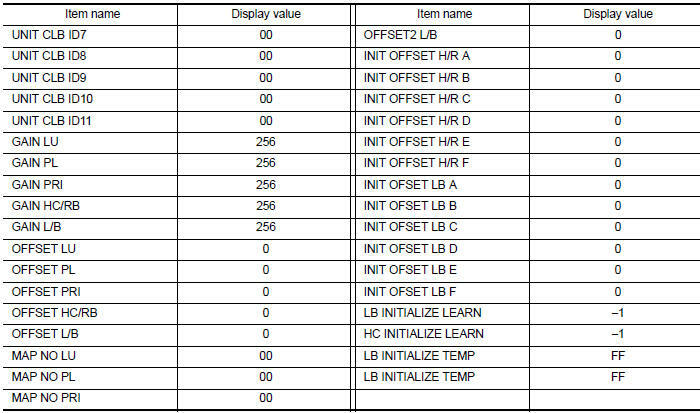 Check the relation between the cause found by DTC and the malfunction information from customer. TM- 244, "Symptom Table" can be used effectively. Check the relevant information including STI, etc. Do malfunction information and DTC exists? Malfunction information and DTC exists.>>GO TO 3. Malfunction information exists but no DTC.>>GO TO 4. No malfunction information, but DTC exists.>>GO TO 5. Check the malfunction described by the customer on the vehicle. Check if the behavior is fail safe or normal operation. Refer toTM-122, "Fail-Safe". Interview sheet can be used effectively when reproduce malfunction conditions. Refer to TM-140, "Diagnostic Work Sheet". Verify the relationship between the symptom and the conditions in which the malfunction described by the customer occurs. Perform вЂњDTC CONFIRMATION PROCEDUREвЂќ of the appropriate DTC to check if DTC is detected again. Refer to TM-125, "DTC Inspection Priority Chart" when multiple DTCs are detected, and then determine the order for performing the diagnosis. Is any DTC detected? YES >> GO TO 7. NO >> Follow GI-39, "Intermittent Incident" to check. 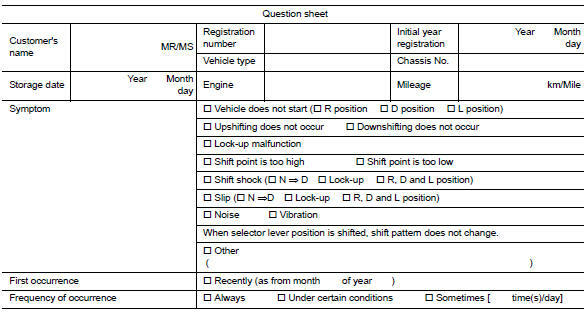 Use TM-244, "Symptom Table" from the symptom inspection result in step 4. Then identify where to start performing the diagnosis based on possible causes and symptoms. Repair or replace the detected malfunctioning parts. Reconnect parts or connector after repairing or replacing, and then erase DTC if necessary. Perform вЂњDTC CONFIRMATION PROCEDUREвЂќ again to make sure that the repair is correctly performed. Check that malfunctions are not reproduced when obtaining the malfunction information from the customer, referring to the symptom inspection result in step 3 or 4. Is DTC or malfunction symptom reproduced? YES-1 (DTC is reproduced. )>>GO TO 5. YES-2 (Malfunction is reproduced. )>>GO TO 6. NO >> Before delivering the vehicle to the customer, make sure that DTC is erased. There are many operating conditions that may cause a malfunction of the transmission parts. By understanding those conditions properly, a quick and exact diagnosis can be achieved. In general, perception of a problem varies depending on individuals. Ask the customer about his/her concerns carefully. It is important to understand the phenomenon or status. To systemize all the information for the diagnosis, prepare the question sheet referring to the question points. When replacing the TCM, perform the following work. 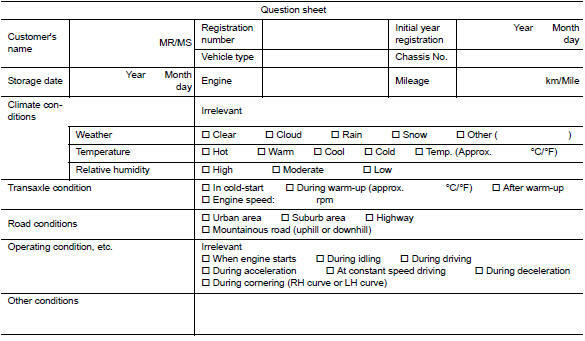 Since vehicle specifications are not yet written in a new TCM, it is necessary to write them with CONSULT. When replacing TCM, save TCM data on CONSULT before removing TCM. The TCM acquires calibration data (individual characteristic value) of each solenoid that is stored in the ROM assembly (in the control valve). This enables the TCM to perform accurate control. After the TCM is replaced, check that the calibration data is correctly loaded and stored. When replacing TCM and transaxle assembly simultaneously, replace transaxle assembly first and then replace TCM. Check new TCM part number to see whether it is blank TCM or not. Part number of blank TCM is 310F6-XXXXX. Check the part number when ordering TCM or with the one included in the label on the container box. Is the new TCM a blank TCM? YES >> GO TO 2. If вЂњAT/CVTвЂќ is not displayed and TCM data cannot be saved on CONSULT, GO TO 3. Save TCM data on CONSULT according to the CONSULT display. Turn ignition switch OFF and wait for 10 seconds. Shift the selector lever to the вЂњPвЂќ position. Check that вЂњPвЂќ is displayed on shift position indicator on combination meter. Displayed approximately 4 вЂ“ 5 seconds after the selector lever is moved to the вЂњPвЂќ position. Does the shift position indicator display вЂњPвЂќ? Turn ignition switch OFF and wait for 5 seconds. Does the shift position indicator display вЂњPвЂќ at the same time when turning ON the ignition switch? YES-1 (New TCM is blank)>>GO TO 6. YES-2 (New TCM is not blank)>>GO TO 7. NO >> Check harness between battery and TCM harness connector terminal. Perform programming according to the CONSULT display. Refer to TM-147, "Work Procedure". Harness between the TCM and the ROM assembly inside the transaxle assembly is open or shorted. When replacing the transaxle, perform the following work. The TCM acquires calibration data (individual characteristic value) of each solenoid that is stored in the ROM assembly (in the control valve). This enables the TCM to perform accurate control. For this reason, after the transaxle assembly is replaced, it is necessary to erase the calibration data previously stored in TCM, to load new calibration data, and to store them. TCM learns indicated pressure for appropriate control of the transaxle assembly and records the learned values. For this reason, the leaned values stored in TCM must be erased after replacing a transaxle assembly. TCM records the degradation level of the CVT fluid calculated from the vehicle driving status. Therefore, if the transaxle assembly is replaced, it is necessary to erase the CVT fluid degradation level data recorded by TCM. Select вЂњWork SupportвЂќ in вЂњTRANSMISSIONвЂќ. While maintaining the conditions below, touch вЂњStartвЂќ. Select вЂњStartвЂќ and complete within approximately 20 seconds. Is вЂњCOMPLETEDвЂќ displayed? YES >> GO TO 2. NO >> Turn the ignition switch OFF and wait for a minimum of 10 seconds then perform the work again. Turn ignition switch OFF with the selector lever in вЂњRвЂќ position and wait for 10 seconds or more. Turn ignition switch ON with the selector lever in вЂњRвЂќ position. Select вЂњSpecial functionвЂќ in вЂњTRANSMISSIONвЂќ. Check that indicated value of вЂњCALIB DATAвЂќ is equal to the value shown in the following table. Is the indicated value of вЂњCALIB DATAвЂќ equal to the value shown in the table? YES >> GO TO 3. Does shift position indicator display вЂњPвЂќ? YES >> GO TO 5. Is the inspection result normal? YES >> GO TO 1. Does the shift position indicator display вЂњPвЂќ at the same time when turning ON the ignition switch? YES >> GO TO 6. TCM stores calibration data (inherent characteristic value) of G sensor to provide accurate control. Therefore, it is required to perform calibration of G sensor after the following work is performed. Adjust air pressure of all tires to the specified pressure. WT-54, "Tire Air Pressure". Never swing the vehicle during вЂњG sensor calibrationвЂќ. Is вЂњCOMPLETEDвЂќ displayed? YES >> GO TO 3. NO >> Perform steps 1 and 2 again. Is вЂњP1586вЂќ or вЂњP1588вЂќ detected? YES >> Go to TM-126, "DTC Index". Check the engine oil level. Replenish if necessary. Refer to LU-7, "Inspection". Check for leak of the CVT fluid. Refer to TM-250, "Inspection". Drive for about 10 minutes to warm up the vehicle so that the CVT fluid temperature is 50 to 80В°C (122 to 176В°F). Be sure to apply the parking brake and block the tires. Start the engine, depress the brake pedal and put the selector lever to the D position. While depressing the brake pedal, depress the accelerator pedal gradually. Read the stall speed quickly. Then, release your foot from the accelerator pedal quickly. Never depress the accelerator pedal for 5 seconds or more during the test. Stall speed : Refer to TM-288, "Stall Speed". Place the selector lever in the N position. Run the engine with the idle speed for at least 1 minute. Put the selector lever to the R position and perform Step 6 to Step 9 again. H: Stall speed is higher than the standard value. L: Stall speed is lower than the standard value. Check the engine oil level. Replenish if necessary. LU-7, "Inspection". Measure the line pressure at both idle and the stall speed. Keep brake pedal pressed all the way down during measurement. Line pressure : Refer to TM-289, "Line Pressure". Idle speed Low for all positions (вЂњPвЂќ, вЂњRвЂќ, вЂњNвЂќ, вЂњDвЂќ, вЂњLвЂќ) Possible causes include malfunctions in the pressure supply system and low oil pump output. Only low for a specific position Possible causes include an oil pressure leak in a passage or device related to the position after the pressure is distributed by the manual valve. High Possible causes include a sensor malfunction or malfunction in the line pressure adjustment function. Stall speed Line pressure does not rise higher than the line pressure for idle. Possible causes include a sensor malfunction or malfunction in the pressure adjustment function. The pressure rises, but does not enter the standard position. Possible causes include malfunctions in the pressure supply system and malfunction in the pressure adjustment function. Turn ON the ignition switch with the shift selector at the вЂњPвЂќ position. Press the shift selector button with the brake pedal depressed, and confirm that the shift selector can be moved to positions other than вЂњPвЂќ. Also confirm that movement is not allowed from the вЂњPвЂќ position to other position without depressing the brake pedal. Move the shift selector and check for вЂњexcessive effortвЂќ, вЂњstickingвЂќ, вЂњnoiseвЂќ or вЂњrattleвЂќ. Confirm that shift selector stops at each position with the feel of engagement when it is moved through all the positions. Check whether or not the actual position the shift selector is in matches the position shown by the transaxle body. Make sure that the shift selector is moved to all the shift positions in the manner shown. (A): Press shift selector button to operate shift selector, while depressing the brake pedal. (B): Press shift selector button to operate shift selector. (C): Shift selector can be operated without pressing the shift selector button. When the shift selector button is pressed without applying forward/ backward force to the shift selector at вЂњPвЂќ, вЂњRвЂќ, вЂњNвЂќ, вЂњDвЂќ or вЂњDsвЂќ positions, there should be no вЂњstickingвЂќ on the shift selector button operation. Check that the back-up lamps do not illuminate when the shift selector is in the вЂњPвЂќ position. Check that the engine can be started with the shift selector in the вЂњPвЂќ and вЂњNвЂќ positions only. Check that the transaxle is locked completely when the shift selector is in the вЂњPвЂќ position. Rotate the wheels at least a quarter turn and be certain the Park position mechanism is fully engaged. Remove nut (A) and set manual lever (B) to the вЂњPвЂќ position. Do not apply force to the manual lever. Tighten nuts to the specified torque. Refer to TM-256, "Exploded View". In tightening, fix the manual lever. Permanent DTC can be erased by driving each driving pattern. ECM recognizes each driving pattern; it transmits signals to each control module when the driving is complete. Each control module erases permanent DTC based on those signals. For details, refer to EC-151, "Description".